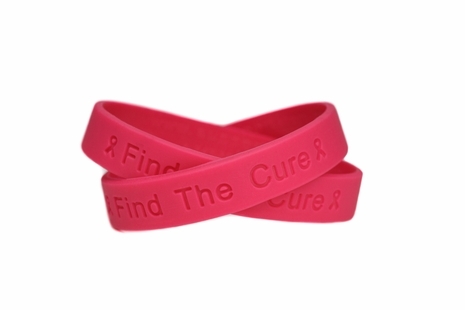 Buy Breast Cancer Awareness Pink Rubber Bracelet Wristbands in one of eight styles! Or to see our entire Breast Cancer Awareness assortment, click here. Give a pink wristband with words of encouragement to someone with breast cancer to show that you're with them in their fight. Give a purple rubber wristband to a breast cancer survivor who has made it into remission. Great for breast cancer walk teams to wear or sell during breast cancer awareness events and fundraisers.